Shuga’ Mommas: Recipe for Success, and Chilli Mac! My husband has been going through a particularly busy patch with grad work this semester and while it is safe to say that I do see him off to work every weekday morning, our time to spend together has all but dwindled to about an hour and a half in the evenings. We make the most of this meaningful time, though: this is when we cook dinner! The first recipe I want to share is one of our recent favorites. We can usually save some for a following evening because there’s definitely enough for leftovers. In a large pot (I used a dutch oven) heat olive oil over medium heat. Add onion, jalapeno, green pepper, and garlic. Sauté until softened, approximately 2-3 minutes. Add veggie crumbles or turkey and break into small pieces. Cook until brown. 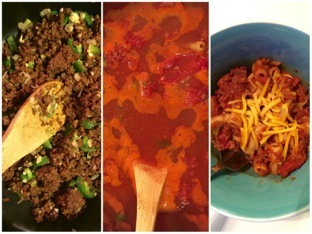 Add chili powder, taco seasoning, cumin, salt, tomatoes, beans, noodles, and water. Stir to combine, bring to a boil and then reduce to a medium low heat. Cook until noodles are soft, approximately 10-12 minutes. Serve with more shredded cheese on top.